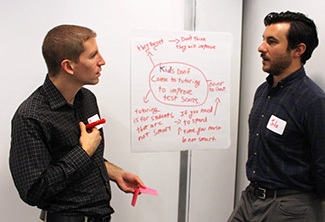 This fall, 12 school teams from across New York City will come together for their first convening on October 11 as part of the 2017-18 Advanced Academic and Personal Behaviors Institute (AAPBI), an initiative of the New York City Department of Education’s Office of Postsecondary Readiness in partnership with Eskolta. Throughout the year, teams will use improvement science methodologies to explore tools and strategies to build students’ academic mindsets (growth, value, and belonging). We spoke with Matthew Raphaelson, an alum and now English teacher at High School of Telecommunication Arts and Technology (HSTAT), about what being part of the Institute last year meant to him and his teammates. What motivated you to get involved in the work of the Advanced Academic and Personal Behaviors Institute? Why do you personally feel this work is important? We had a whole-school PD [professional development session] on mindsets at the beginning of the year, and our principal gave us the opportunity to continue the work and participate in AAPBI. I was personally interested because I wanted to learn more to help the kids that keep me up at night—the ones for whom I worry about why I can’t reach them. There is no silver bullet to it, but mindset strategies became another tool in my toolbox to be able to try to do just that, to reach those students. How did you decide which central problem to address at HSTAT? We have a number of interventions for our students who are at risk of dropping out: we have a college- and career-readiness course; a mentorship program, summer bridge; and we do leadership circles. But for a number of those students, the interventions have not resulted in higher grades. So, what is it about what we are doing that is not reaching those students’ needs? How do we address those kids that keep us up at night? What was the big change idea you implemented? What were the lessons you developed like? The data from the mindset survey we conducted at the beginning of the year revealed that students in my leadership class had a low value mindset. So, I developed lessons with the aim to help students to discover the connections between their passions and their interests and classroom learning. In one lesson I gave students a copy of Bloom’s Taxonomy, which gave them an idea of skills that successful students should know and have. I asked students to name the skills from Bloom’s they would need to have for the jobs that they wanted. For instance, one student wanted to be a nurse, so she said she might have to evaluate a patient’s condition in the moment. Then I gave them a mini-lesson on why teachers use Bloom’s Taxonomy and how they think it could help students. Students then drew connections between some careers based on their passions and interests and actual classroom scenarios. They had to describe those connections. In the debrief I found that students were able to articulate how some of the skills that they had learned in classes that they commonly overlooked could prepare them for situations in real life. There was a sense of utility in their learning that started to develop. What impact have you seen as a result of these lessons? I did have students write down why they drew the connection that that they did, and one example stood out to me. One student, who wants to be a cop, wrote that he might need to be able to use the skill of “evaluating” if there was a suspect in the car and he would need to evaluate that situation. That may sound unremarkable, but to have a kid that has low attendance and low grades to be able to articulate something like that is really cool; it’s meaningful. You are an alum of Tele and now a teacher there. How has your experience of the school as a teacher differed from your experience as a student? Back when I was a student I don’t think we had institutes like AAPBI that were actively studying the connections between student mindsets and student performance. I think, rather, it was boiled down to what was just considered good teaching and a “kindness factor” with administrators and adults. What registered with me when I was fourteen or seventeen years old, and what also registers today as a teacher on the other side, is the sense of belonging that our school fosters. I think we do a really good job at that, and I think our kids really do feel a great deal of spirit when it comes to the school. As a teacher, what do you hope you can help students walk away with from your class? I was a lucky kid. I had my share of problems, but on the whole, I was lucky enough to have supportive parents that helped me gain a growth mindset, and most of the time I had teachers who were extremely kind and did the “academic behaviors work” that back then was just described as good teaching. Focusing on academic behaviors is what it takes to support a student’s whole self. I was lucky enough to get that good stuff. I want every kid to have that, and academic behaviors is just one piece of that giant puzzle. What advice or insights would you want to share with other schools engaging in similar work, or are just starting out in the process? Don’t be afraid to try things. To be honest, it still feels like experimental territory. I definitely did not have a manual of how to run a restorative circle with at-risk students, but at the same time, I did it and I’ve seen some success. Don’t be afraid to try. Embrace experimentation. But actually do it.